U.S. stocks finished little changed near all-time highs on Friday, as Wall Street bemoaned a slower pace of economic growth during the final quarter of 2016. The gross domestic product (GDP) growth rose at a 1.9% annualized pace during the fourth quarter, far lower than the prior quarter’s 3.5% gain and missing economists’ projections for 2.2% growth. The weakness was primarily caused by the largest trade drag on growth since the second quarter of 2010, as net exports slumped. For all of 2016, GDP increased by 1.6%, compared with an increase of 2.6% in 2015. Despite the weaker growth report, all three major U.S. equity indices ended the week higher. The Dow Industrials and S&P 500 posted their first positive week in three weeks, as the Dow Industrials climbed +1.34%, the S&P 500 added +1.04% and the MSCI EAFE (developed international) jumped +1.29%. The extraordinary rise of the U.S. dollar since mid-2014 has encompassed two phases. First, beginning in 2013, came the breakdown of arguably overvalued developed country currencies --the Japanese yen, the Euro and the Canadian dollar. Then, as Chart 1 above shows, in 2015, began a major correction of Emerging Market (EM) currencies that had lost competitive advantages against the developed market’s group --notably China, Mexico and a host of smaller emerging markets. As the dollar became everyone’s safe haven, the Fed’s Major Trade Partners (MTP) based USD index rose nearly 20%, depressing U.S. exports and pushing U.S. manufacturing into recession. The U.S. dollar is expected to stay in a high-level trading range, according to Argus Research. The MTP dollar reached a peak a year ago and remains around that level. The Other Import Trade Partners (OITP) , the so-called EM dollar, has risen roughly 6% in the past year, but it has done so against China and other Asian economies, from which we import but to which we export relatively little. The surge in U.S. exports and manufacturing orders suggest the dollar stands at cyclical highs. 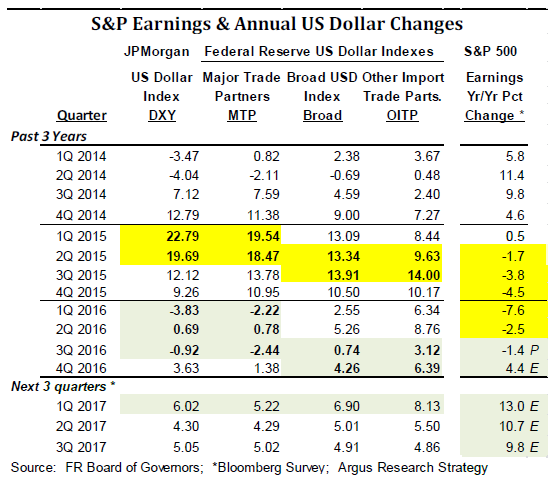 Argus Research says the U.S. dollar momentum has peaked, reducing the negative impact on U.S. earnings.The year-over-year rise in the greenback have fallen from 14% to 20% in 2015 to mid-single-digit levels this year and next.